Hi, I would like to report an unknown error message in version only 1.2.0. This issue does not exist in previous versions! 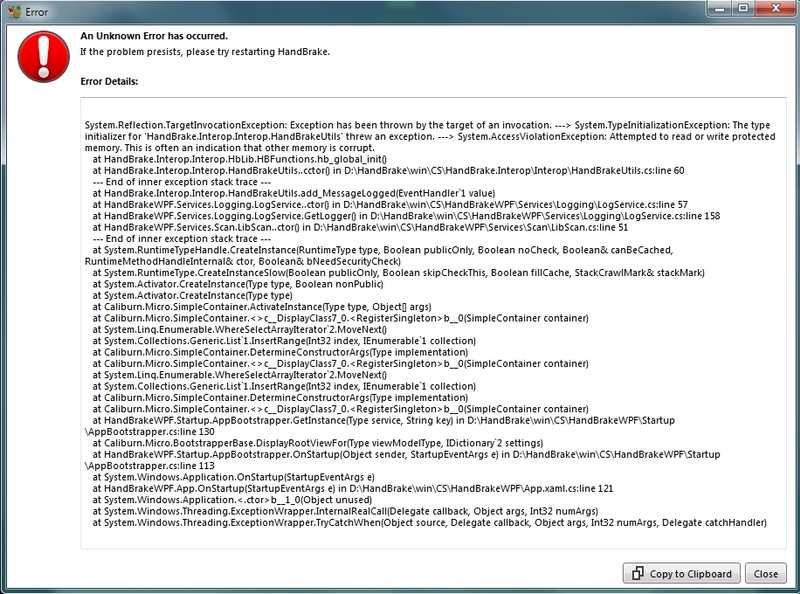 Error Message: When starting the program, it gives this error. I wish conveniences. Good days. 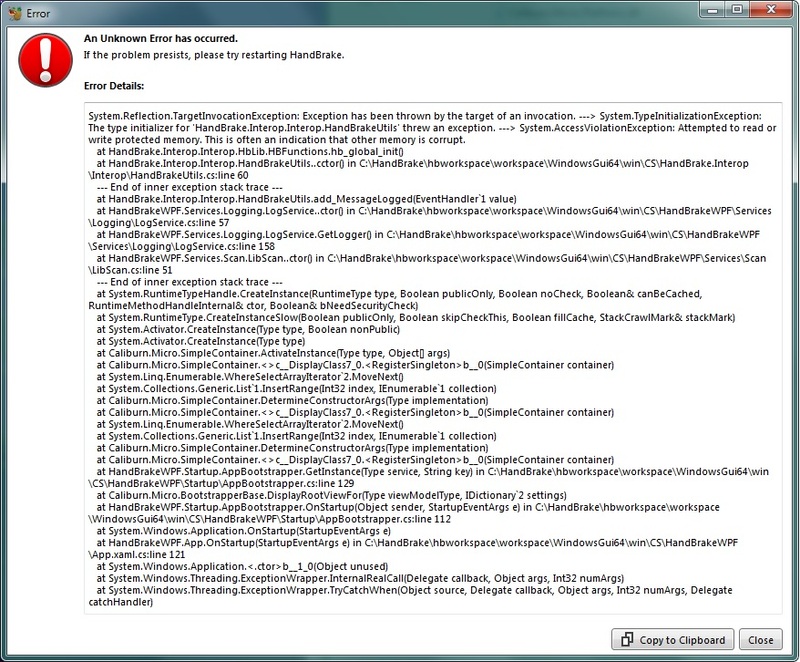 Unfortunately this is a system issue and not a problem with HandBrake. Also unfortunately I've not been able to get sufficient information from anyone else experiencing this to figure out what it is on certain systems that cause this. what other software you have installed. I'm not sure if there is some common factor that I can extract from this but I'll try mimic an environment if possible to see if I can't reproduce it. We've seen a lot of problems in the past year with other software installing broken shell extensions into windows, so certain shell and direct3d APIs crash the system when called. I'm not sure if this is related here or not but that's why I'm asking for the software list. Just checking back in. I'd really like to do some more investigation but unfortunately without more information we can't do anything. If I don't hear back I'll close this out. If anyone else has this info, please do post. I'm sorry for answering late. I can share if you need any other information. I wish you success. Then run "HandBrake Nightly" from the start menu. It's a slightly crippled build with some functionality turned off just to see if we can isolate an affected area. Also check the activity log window to see if anything is printed there. If this works, I'll probably have to throw a few builds your way to narrow it down. I'll prepare a couple of DLL's to throw your way tomorrow if you don't mind. We should be able to narrow this down to the particular check and figure out what's wrong now. Of course I would like to help for other tests. It is a good thing that such a useful program is stable. Note: I apologize if there is a mistake in my English. Can you please try these in order by dropping hb.dll in and running HandBrake each time. I'il try, but now I hesitated! Because I had done the previous test on Nightly Builds HandBrake-20190122165149-557a331_x86_64-Win_GUI.exe. I uninstalled Nightly Builds for a folder conflict problem with HandBrake-1.1.1-x86_64-Win_GUI.exe, which was preinstalled yesterday. Now, I can't find the Nightly Builds HandBrake-20190122165149-557a331_x86_64-Win_GUI.exe file in the site archive! 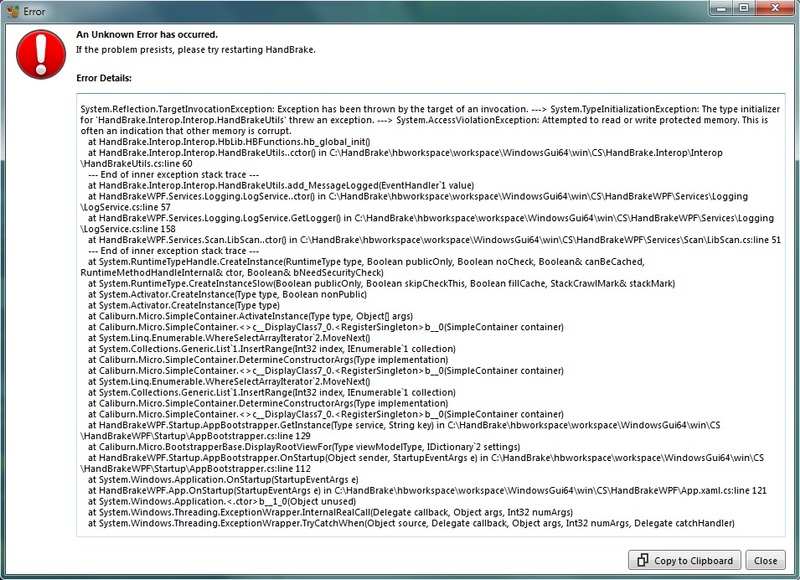 I'm doing these tests on Nightly Builds HandBrake-20190123-557a331_x86_64-Win_GUI.exe instead. I archived it. If you need to do the tests with the Nightly Builds HandBrake-20190122165149-557a331_x86_64-Win_GUI.exe file, if you upload this file I can repeat the tests. The reason for the error in the following 3 tests is that it is caused by the Comodo Firewall block. It was detected later! Might throw you another build that fully disables QSV rather than just hardware detect to see if that works for you. Any recent nightly build is fine. To confirm that theory, throw this hb.dll onto your nightly. The same result also gave for HandBrake-20190124-2986505_x86_64-Win_GUI.exe. hmm, I wonder if your system is failing at multiple points. 2 More if you have time. Test-6 and Test-7 also worked successfully. In summary: Except Test-1 and Test-5, all worked without errors. I'm here to help if you need other tests to improve the program. Good works. I've created a debug pack. It's a little more involved. 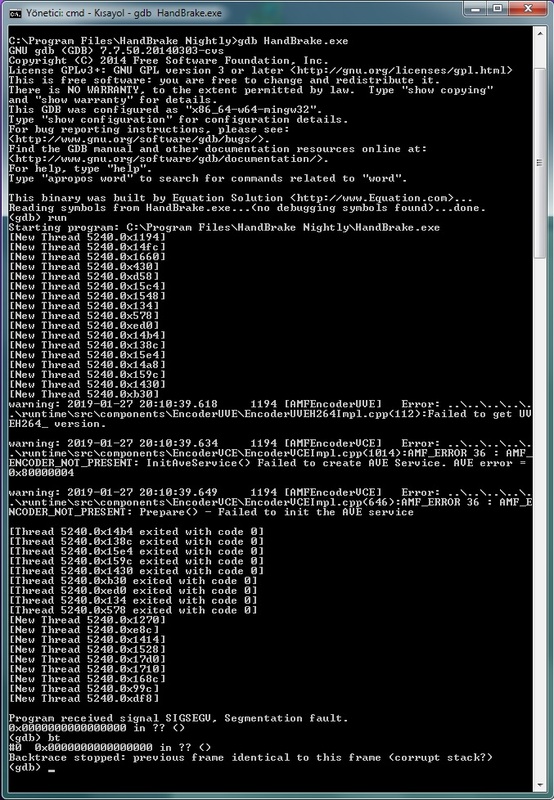 This will hopefully provide a stack traces. Huh, it didn't crash. 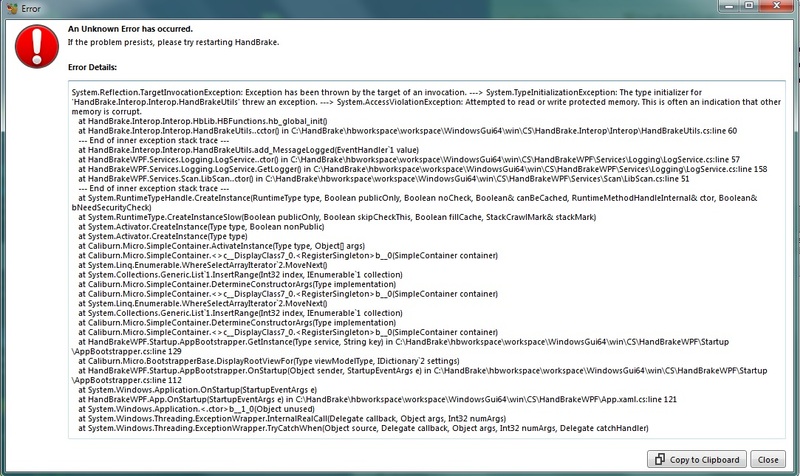 I'm pretty sure it's calling the same hb_global_init that's crashing from the GUI. 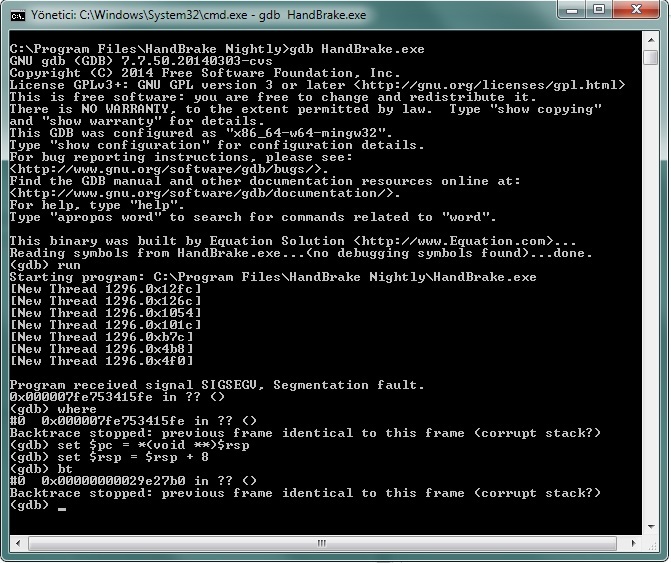 This is HandBrakeCLI 1.2 or the nightly build right? I have downloaded HandBrakeCLI.exe from the above link. Handbrake 1.1.1 and Nigthly Buids 20190123-557a3311.0 versions were installed on the Pc together. If necessary, I can install version 1.2 and repeat the test? Maybe try this another way. 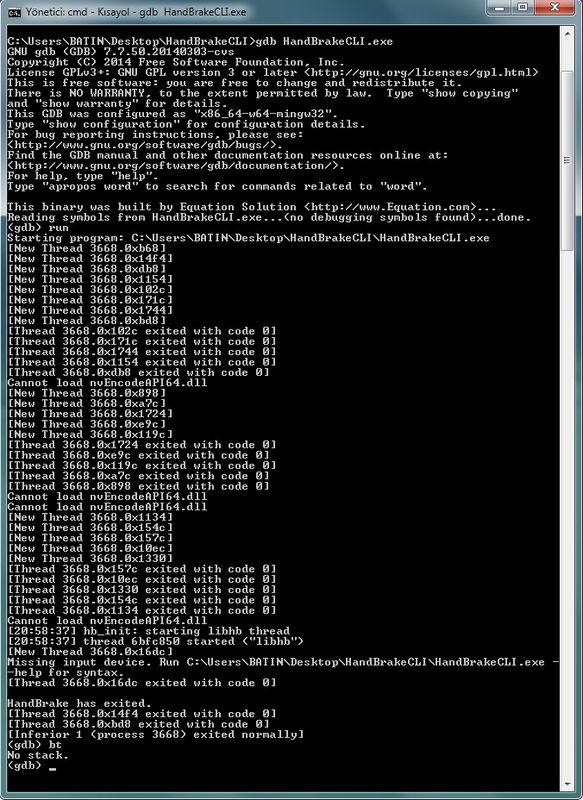 I was hoping HandBrakeCLI had the issue too, but if the one I included isn't crashing, the other way we can do this is to drop gdb.exe into your currently install of the nightly build in program files (the one that crashes). when it does, run the "bt" command again. You didn't need --help but the GUI would ignore that anyway. OK, good, so it's crashed out inside GDB and it looks like it's happened at or shortly after the AMD VCE hardware probe concurs. I'm prepping a symbols build, as "bt" didn't actually tell us exactly where. Kind of expected since the hb.dll didn't include symbols needed. Give me 40 minutes to build and package a new hb.dll that you can drop into that folder. Drop that in your existing nightly install. Verify it still crashes. Then run it via gdb and do bt when it crashes. It's interesting that we are not getting a trace here. I'd have thought it would at the very least give us a line where it exists HandBrake and goes into the system. There is another user on the forum running the same test. Going to puzzle over the code for a bit to see if I can't spot the problem. I atleast have a general area to look in now. I downloaded HandBrakeCLI-1.2.0 from the link below (https://handbrake.fr/rotation.php?file=HandBrakeCLI-1.2.0-win-x86_64.zip). I don't have anything immediately I need tested but I'll drop updates if I figure anything out. So, we have a user in the forum that's traced a crash back to amfrt64.dll but is running much older driers (due to lack of support from AMD) which I suspect is just an incompatibility issue that we can probably workaround. However, your running 18.9 so that doesn't explain things for you. They did however get a bit further in gdb. However, your running 18.9 so that doesn't explain things for you. I'm sorry, I forgot to notify: On January 23, I upgraded the GPU driver to Adrenalin 2019 Edition 19.1.1 (not beta). Does that change things? I added Hb.dll to Nightly Builds. (https://download.handbrake.fr/hb.zip). I assume that's with the hb.dll I provided that's 800ish MB? Scott, does the Segmentation fault here mean a crash? Normally, you get a trace of method calls before the crash occurs. This give you an idea where it crashed. In your case your not getting it at all. 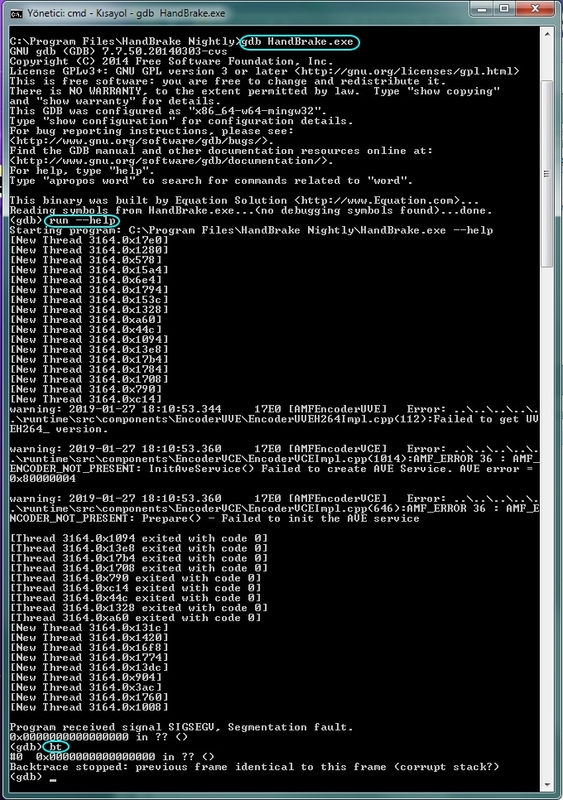 gdb gets a bit funny when the crash isn't happening inside the app it's watching. It's basically just telling us it was a crash. 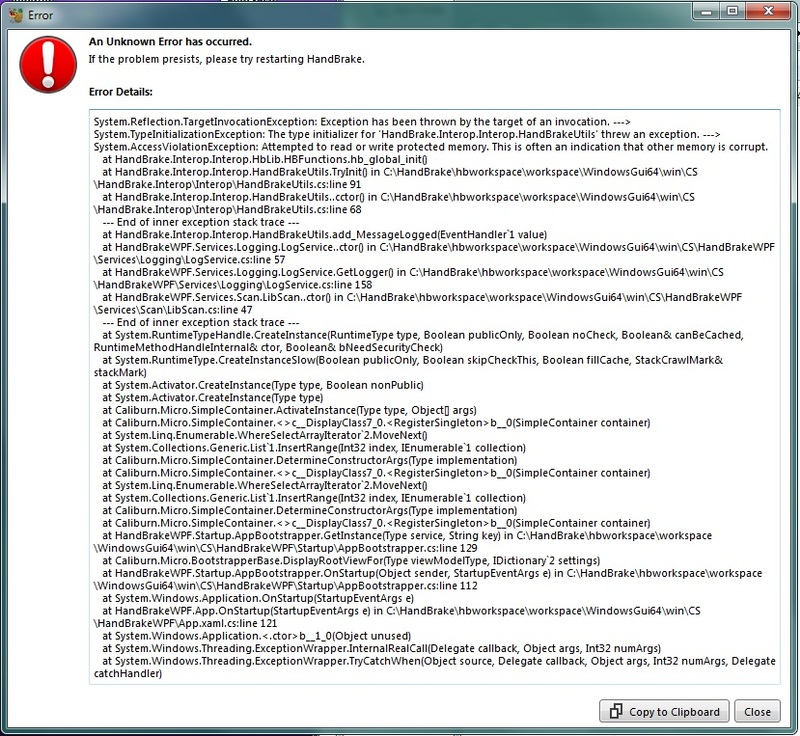 I was kinda hoping we'd see the same amfrt.dll line that the user on the forum got as it'd confirm it's the same issue. We may still be dealing with 2 issues. I'm not 100% sure. I've pinged a contact at AMD to see if they have any open issues regarding this on APUs. Failing that I've had some ideas regarding hardware checks to change how things are ordered to make it easy to disable them that might end up being the solution. Introduce a "fallback" mode that HandBrake will attempt (Where possible) if the hardware detection causes a driver level crash. Depending on how the driver crashes or errors, there is no guarantee this will work but it's worth a shot. If you still get the crash before it tries fallback, then I'll add an additional explicit option to flat out disable hardware encoding rather than "Attempt and fallback". Can you guys let me know if the next build helps at all? Sorry, Scott. I don't know enough, I did not understand and my English is not good. There isn't a patch here. Do I need to create a patch from the codes here? I don't know how to test it? Is next build the last nightly builds or the patch made of these codes? I may have forgotten something, but I don't understand. Ah, I think I see why it didn't auto-fallback. I cannot send an image of the About menu because Nightly build has not been opened. Once more please. New Nightly pushed. Of course... I installed HandBrake-20190216-e6cd082_x86_64-Win_GUI.exe. After the start: Ram usage 75% to 95%. There is no warning about Hanbrake and the program does not start. 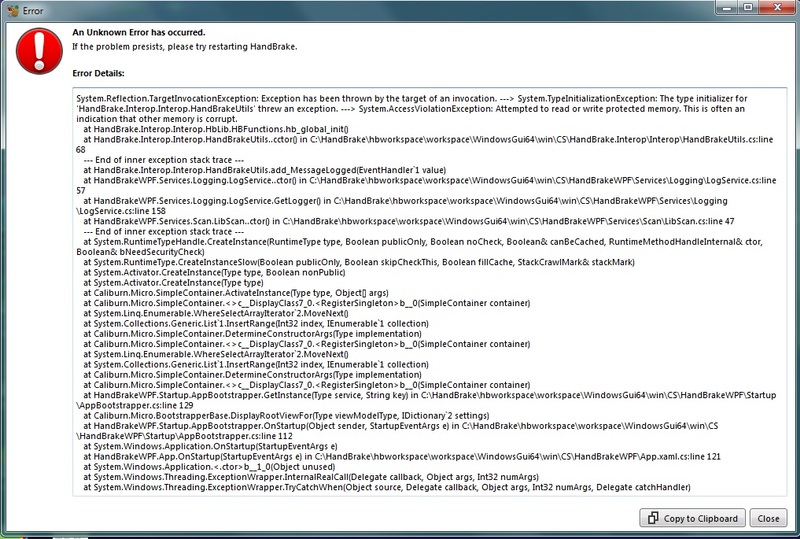 When I stopped the HandBrake process from the task manager and run it again, it gave the same result. But, was the Debug Pack required for the Gdb command to work? I wanted to download the package this night but the link didn't work. Defiantly wasn't expecting the behaviour your seeing here. cyko confirmed on the forums he saw the same thing with the no-ui and memory leak. Not sure how that's possible but I'll look into it.